Two years ago, Snack Girl picked on Edy’s Popsicles. Why? These popsicles were named “Fruit Bars” and the first two ingredients were water and sugar (where’s the fruit?). You can read the scintillating post here - Don't Be Fooled By This Popsicle Marketing Trick. I received an e-mail from a reader asking me if I had checked out the NEW fruit bars. I guess I have been asleep at the wheel because Edy’s has revamped their packaging and ingredients. Now the label has “blueberry juice from concentrate” as the second ingredient. Is this an improvement over “sugar”? I would have to say, “No. It is the same.” I looked it up because I was confused and found that many reliable sources count "fruit juice concentrate" as added sugar. My conclusion, dear reader, is that the new Edy’s is the same as the old Edy’s. The words may be different but the ingredients are essentially the same except for one thing. More sugar! The new bars have 10 more calories than the old bars and all of them can be attributed to sugar. 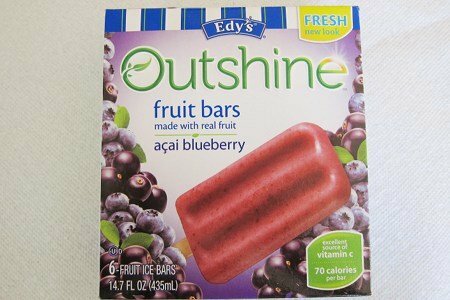 If you are looking for actual frozen fruit bars, they exist. I have found a couple of different brands in my supermarket. Have you been tricked by “fruit juice concentrate”? "Despite what you may have heard, there's no nutritional advantage for honey, brown sugar, fruit juice concentrate or other types of sugar over white sugar." ...mayb not much nutritional advantage but surely being counted as "less grams" of sugar per serving counts for something... right?? It would if there were actually fewer grams of sugar per serving. Both versions have 16 g sugar per serving, so there's really no improvement. Could you address the difference between soy lecithin and soy protein isolate and the problems with each? 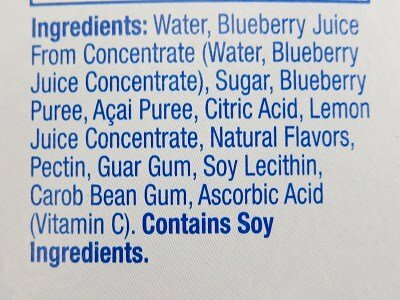 I know soy protein isolate is processed soy, stripped of any nutritional value, leaving a concentrated source of phytoestrogen, but am not sure if soy lecithin is the same thing using different terminiology and if it is as bad for us. Thank you! CHEAPER AND EASY REAL FRUIT AND A PROCESSOR. BY POPSICLE HOLDERS AND THERE YOU GO. ALL NATURAL AND THEY TASTE BETTER. When it gets hot my husband will start buying these like last year thinking I will approve. He does like the 365 Whole Foods brand. What about the honey, I guess Mayo is saying no nutritional advantage but am I correct in thinking it at least does not spike sugar levels in the body?? But still a better choice than water/corn syrup/food coloring Popsicles, in my opinion. its not a better choice sugar is still sugar.. if the popsicle was any better the ingredients would state fruit in the first 2 ingreidients instead its fruit juice from concentrate. 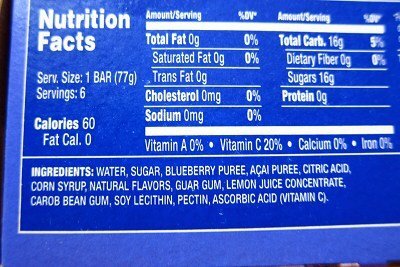 i would rather make my own and know that im not eating a popsicle that is just juice and sugar..
Why in the heck is there soy lecithin in popsicles? Carob bean gum? Guar gum? This is ridiculous. I make my own popsicles every summer, using 1 real, organic ingredient... fruit that I puree and pour in popsicle molds. Food does not need to be as difficult, or as unhealthy!, as Edy's is trying to make it. Just freeze a banana on a stick and eat that - yummy! It's scary to think about what they are putting in our food and passing it off as healthy. I read the other day that they were changing the name of an artificial sugar to hide it. I don't know if this is true, but I hope it isn't. Thank you so much for taking the time to give us all of this good information. I'm reading fruit juice FROM concentrate followed by "juice concentrate and water", so sounds to me like it's RECONSTITUTED fruit juice, but it's back to it's original consistencey (or close to it), and it's NOT still concentrated. So do they get some credit for that? Any difference between reconstituted and fresh squeezed juice as far as grams of sugar? I'm curious about that. I know juice has more sugar than the actual fruit. And I'm sure fresh squeezed has more nutrients than the reconstituted. Thoughts? Ditto what LitChick said What do recommend and does anyone have a healthy sub for crescent rolls? Thanks! Try Whole Foods and Trader Joe's they are in a tube also, but do not have hydrogenated oils. Still the can crescent rolls have enriched flour. Lets see if anyone else has a healthier version... our family has for breakfast maybe every 3-6 months, I will open a can. They are so good. Hard to give completely up. Thanks Lenora! I will try the Whole Foods. a little more decadent, but REAL fruit - Banana Babies (dark chocolate covered)! I've always thought that the primary advantage that raw sugars and honey have over white sugar is a lack of the chemicals they add to make it white. That, of course, assumes that your 'raw' sugar is actually raw. From a calorie standpoint, they're about the same, but they aren't bleached or chemically altered. It all depends on what you (or the kids) might be having for a snack instead. If this bar is replacing real fruit, then not so great. But if it is replacing snack cakes or chips, then I say go for it! Also, it is a matter of convenience. Yes, I can make better bars myself, but do I?